Consider engagement initiatives. Mutual learning reminds us that everyone has something to teach and something to learn. Mutual respect is essential and sometimes needs to be carefully nurtured through conversations and actions to address conflicts and disappointments that might characterize previous or current relationships. Community engagement can foster countless opportunities to identify and share new information through different ways of knowing. Mutual accountability can enhance community engagement when all participants are willing to be accountable for achieving results through their common efforts. Everyone can take responsibility for some part of what needs to be accomplished to achieve a common goal. 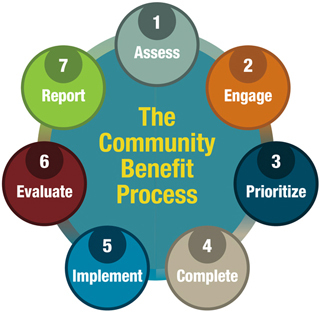 Assess the capacity and readiness for implementing a community engagement process. When hospitals proceed to engage community members, they will first want to examine their internal systems, ways of working and culture. This examination can then help the hospital address or change behaviors that could impede the relationships needed for effective community engagement. For example, during or after an assessment process, information about the determinants of health should be presented in ways that are not overly technical or filled with jargon. Community stakeholders and the hospital should create mutual learning opportunities so that data/information can be fully understood and valued. Another prerequisite of a hospital’s community engagement is a clear sense of the nature and duration of the engagement, and resources that can be committed to relationships and activities. This includes, but is not limited to, adequate staffing, funding, information sharing and program activities. Involve people and organizations that reflect the communities with which the hospital will work in the community engagement process. The best community engagement process is not created in isolation from the community and stakeholders. Therefore, it is essential to acknowledge, understand and involve people and organizations that are led by and/or serve multicultural communities and constituencies. This process requires identifying the people and organizations that know these communities and are respected for their contributions. Spend more time in informal conversations and meeting places than in formal meetings, presentations and settings for as long as a community engagement initiative is active. Outstanding community engagement efforts reach out to other large organizations, such as public health departments, that can become allies in community benefit work. When initiating a community engagement process, consider inviting a community-based organizational partner to help focus and implement the process. This organization can serve as a community home base for the process. Such a partner can help organize and facilitate the meaningful involvement of community members. Be prepared to mutually develop specific expectations for the roles and responsibilities of this partner and the hospital; establish ongoing, culturally appropriate communication on activities and desired results; and offer financial resources that are necessary for this partner to effectively work with the hospital. When community engagement activities are implemented by a hospital as a part of a community health needs/resources assessment process, a relationship with a community-based organization can help ensure that community participation is authentic and based on mutual respect, learning and accountability. If an organizational partner is not available, gain perspectives and advice from well-informed individuals who have the trust of diverse groups in their communities. Consider building community engagement activities to establish a more formal partnership for implementing action plans based on a community health needs/resources assessment. Community engagement is important for increasing the relevance and authenticity of the information for community benefit plans that meet IRS requirements. Community engagement is an essential element in the Catholic Healthcare Association of the United States community benefit planning process and in the recommendations of the Public Health Institute’s Advancing the State of the Art in Community Benefit demonstration project. Community engagement can evolve beyond advisory roles in community health needs/resource assessments. For instance, some hospitals organize a formal implementation partnership with those that participated in the community engagement assessment phase and other community stakeholders. If this phase already includes a community home base partner, a hospital can expand this collaborative relationship to other organizations and community members. A community engagement process that includes the creation of a partnership for implementing plans to address health priorities can be of great value. Reach out to community leaders – meet with community leaders to learn about issues and access other community members. Community leaders can also help spread the word by disseminating important information. Hold public and house meetings – this can include organizing town meetings to hear opinions and share information with attendees. Hold house meetings for those who do not feel comfortable sharing their opinions in larger, public meetings. Go door to door – this can break down barriers and suspicions, gather unfiltered information, and add to the credibility of your efforts. Street outreach – it is vital to go to where the community is rather than expecting it to come to you, e.g., barber shops and beauty parlors – outreach is truly a grass roots strategy, one that is common in community-organizing work. Tabling – set up a table with your information in front of supermarkets or at community functions such as health fairs. Attend community meetings – this strategy is very helpful, because it shows you are interested in what the community finds important. You can observe or participate. Showing up means a lot to people who may have questions about who you are and what you are doing in their community. Community-driven assessments – this is as a way to create trust and authenticity in the community engagement process. Community residents and other stakeholders can help determine and assess the scope and substance of a community health needs/resources assessment.